In their first joint appearance, Trump tried to draw a sharp contrast between Pence and Hillary Clinton. Republican presidential candidate Donald Trump introduces Mike Pence. DONALD TRUMP INTRODUCED Indiana governor Mike Pence as his running mate today, calling him “my partner in this campaign” and his first choice to join him on the Republican presidential ticket. In their first joint appearance, Trump tried to draw a sharp contrast between Pence, a soft-spoken conservative, and Hillary Clinton, the Democratic presidential candidate. In fact, he spent more time lambasting Clinton than praising Pence, declaring she had led President Barack Obama “down a horrible path” abroad. He said Pence would stand up to America’s enemies and that he and the governor represent “the law-and-order candidates” at home. He’s a solid, solid person. The joint appearance at a midtown Manhattan hotel was choreographed to try to catapult the party toward a successful and unified Republican National Convention, which kicks off in Cleveland on Monday. Republican officials were overwhelmingly positive in their reaction to Trump’s selection of Pence. Trump conceded that one of the reasons he’d selected Pence was to promote unity within the Republican Party. “So many people have said ‘party unity,’ because I’m an outsider,” Trump said. I don’t want to be an outsider. Pence, whose calm demeanour forms a marked counterpoint to the fiery Trump, was chosen in part to ease concerns in some GOP corners about the billionaire’s impulsive style and lack of political experience. 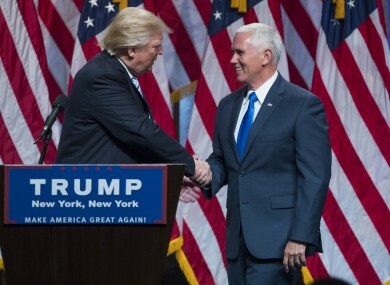 The Trump-Pence event offered Americans the first glimpse at what the 2016 Republican presidential ticket will look like, barring the unexpected. Just as Trump was settling on Pence, Republicans gathering in Cleveland essentially quelled the movement to oust Trump at the convention, all but assuring he’ll be the GOP nominee. And they got crushed immediately, because people want what we’re saying to happen. Clinton’s team was already painting Pence’s conservative social viewpoints as out of step with the mainstream. Email “"My partner in this campaign" - Trump introduces Mike Pence as his running mate”. Feedback on “"My partner in this campaign" - Trump introduces Mike Pence as his running mate”.